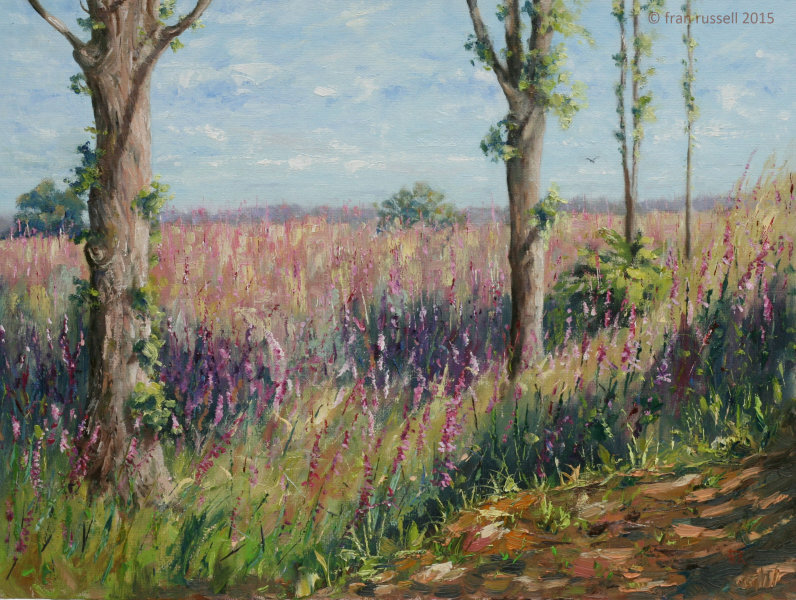 I came across this amazing view of wild foxgloves growing in a dip in the land very close to home about a month ago. At the time I was busy taking part in SEOS, but promised myself that I would return as soon as I was able, hoping they would still be in flower. Luckily they were. While I was painting, the farmer who owned the land drove past and stopped for a chat. Fortunately he was very friendly and did not object to me being there. He told me that he had cleared the land of a lot of the trees a couple of years ago and this year the foxgloves had all appeared. There were hundreds of them - it was spectacular and quite magical! He also told me that the dip in the land was an old stone pit, hence the road that this land is on, is known as Stone Pit Lane. Foxgloves in the Stone Pit. Oil on board, 30 x 40 cms. Pre-selected for the Royal Society of Oil Painters (ROI) Open Exhibition 2015.